Boilers need air to operate efficiently. Additionally, they operate even more efficiently if that air is warm, which can present a problem in the Winter. 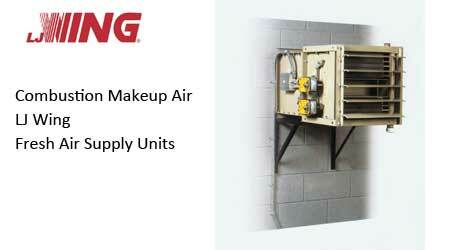 In many cases the operating air for boilers is provided via louvers in the boiler room wall. This is, or has been, an obvious solution to providing air. The International Boiler Code prescribes 1 cubic foot per minute of combustion air for every 2,400 BTU/hour of boiler output heat. When utilizing natural ventilation that converts to 0.1 square foot per boiler HP. However, utilizing wall louvers per this code can lead to very large wall space demand and inevitably introduces cold air into the boiler room which makes for an uncomfortable environment, possible freezing, and an inefficient boiler. According to the US Department of Energy, a boiler gains one percentage point of efficiency for every 40 degree temp rise in combustion air temperature. Fortunately RJ Owen Associates and LJ Wing Company offer an affordable and efficient solution to this with the Model FAS-U Fresh Air Supply Unit for Boiler Combustion Air Preheat. The FAS-U mounts through the wall utilizing a much smaller space as forced air delivers the required combustion air with much less wall space demand. The air is then heated through steam or hot water coils integral to the unit, which are modulated for temperature control via LJ Wing’s Integral Face and Bypass design which helps prevent coil freezing. Contact RJ Owen Associates to speak to a representative about designing a Combustion Air Preheat System for your boiler, at 336-869-7579.